The Palace of India is a small and friendly family run traditional Bangladeshi Tandoori restaurant situated in Farningham Kent.
" We have facility for any fucntions or parties. 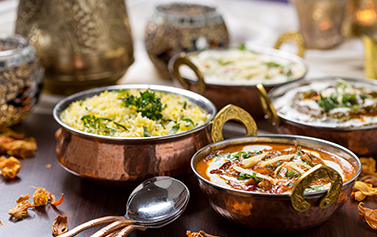 We do catering service for any parties "
The Palace of India is a wonderful restaurant. The food really is second to none. The staff are both knowledgeable and pleasant a real credit to the place. Be warned once you’ve been you’ll be returning again and again. Brilliant food.... Nothing to dislike staff are very friendly and helpful. Easy parking only a few minutes away. With local pubs to visit later after your meal. I’ve lived in Kent for 10 years and until today had given up hope on a good Indian meal, This place has made my day at last a good curry experience,will be my local now even though there a half hour drive from mine Joe.